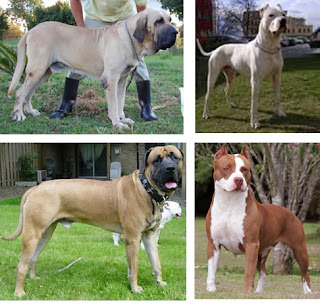 Dog Site: Dangerous Dog Breeds and Why? Dangerous Dog Breeds and Why? Sadly many dogs like pit-bull and other fighter breeds are said to be a threat to the country. So the government is now in the process of eradicating the fighter breeds. Many dog owners that have been harmed by the dogs are also in the move to finish away this breed. What happens is that many of the dog owners do not understand the psyche of the dogs. Every dog has his own qualities and talents to show. If a dog is from a fast paced breed so he wouldn't stay much at home and play a playful breed. The basic thing one needs to do before getting a dog is to browse and look all over for the information about the dog because if you have a poor research on the breed you are purchasing then you are going to be great trouble. Just few months a lady by the name of “Linda” came to me to purchase a “Border Collies” saying that she lived a suburban life so the dog would be happy. Now according to her the breed was laid back and would be the right choice for the life style she wanted. I had advised her not to purchase the breed since what she thinks is just the opposite of my research. But later she purchased two border collies for herself and was sufficiently happy. Later she faced innumerable trouble with those two dogs. She called up saying that the dogs are more like a trouble breed. This is not true but the breed is one of the most active breed man has ever come across. It is sprint and fast. The breed is said to be highly athletic and are also used as guard dogs for houses. The lady’s poor research nearly had cost her, her life. Many of the dogs that are said to be a risk to man’s life today are they actually are a threat or not let’s have a look. Are the dogs lumped into the general heading of pit bull really a danger? Let's first look at the group of dogs called Terriers as a whole. Most terrier breeds developed in Great Britain and Ireland. These were dogs of varying sizes from the tiny Yorkshire (originally a mouser) and Norfolk, to the medium Lakeland, the ancestor to the American Staffordshire Terrier (close relative to the American Pit Bull Terrier), to the giant Airedale. These breed has a different kind of a sense they are all hyper. They are supposed to be dealt in a different way and their wants are poles apart different from the other breeds. Usually we do not have a defined research about the breed we are interested to purchase, so that is what actually creates kayos. This blur imagination and research can only be washed away until and unless you consult a reputed dog breeder or kennel. Make sure he is registered with “AKC” club which would make him an official and legal person to suggest on you’re regarding query. Now the breeds falling between these size extremes are breeds such as the Fox Terriers, Norfolk Terriers, Scotties, Wes-ties, Bull Terriers, Staffordshire Bull Terriers, Manchester terriers and many others. Terriers as a whole were bred to hunt vermin. They were bred to be tenacious which is the breed is suppose to breed. Though a terrier may not start a fight, but the sad part is they do not back out from a fight too. This means if they see coming their way seems fishy to them or would be unsafe for them they would attack. This habit of theirs is considered to be harmful but if you notice there is a reason why they behave irrational like this and there are also remedies to prevent them from this habit. The ancestors of all dogs are pit bull. They are a very stubborn breed and tenacious too. They were basically herding dogs and were used in farms. This breed is highly capable of being a watch dog or a guard dog. They exactly know how to take care of their masters but at the same time they act very rigid due to which they are also in the list of bad behaved dogs. These are traits that in any breed require a knowledgeable and experienced owner. For example, Australian Cattle Dogs (heelers) have traits very similar to Terriers that make then unsuited for novice dog owners. Not only do they have a herding drive, this drive makes them very much wild and annoying at times. This is their habit and they are known to be like this. One should not purchase them thinking could be suitable for being a lap dog or house pup. An ACD is a tough dog and cannot be tackled if they get wild by a single person. In fact they get vicious at times but they are not considered to be a dangerous breed. Now that’s funny all my readers. This one has bought jitters down my spine. I have personally been with several kinds of dogs like; American Pit Bull Terrier or generic pit bull from a good source and in a good home that posed any more danger than any other Terrier. When I think of the dangerous dogs I have known over the years, the first ones that come to mind now are a Chihuahua, an Australian Shepherd/Dalmatian cross, and a Golden Retriever. All these dog that I came across were from poor homes and they were not kept in a good condition. Some came from negligent homes and some from bad breeders but all of them looked in a pretty miserable state. It is never the breed it is always the way you treat the dog and above all they were not treated according to their breed. Most of them came from a dog production where dogs were just produced just for the sake of making business. The danger a dog possesses comes from the man who is taking care of the dog. If the dog was not taken of good care then how can the dog be in a good state of mind? No breed is a bad breed, we need to look upon them as individuals and analyze their problems. An American Pit Bull Terrier from a good source and in a proper home more than a Labrador retriever from a poor source and a poor home. When evaluating the threat posed by a dog breed. Medical issue like a form of seizure disorder called Rage Syndrome (and must be diagnosed as Rage and not a dog who is poorly trained and socialized) or other chemical imbalance that may cause a dog to be an inherited risk. But this is in rare cases most of them are not a threat to life it all depends on the way you breed the dog. Just by secreting the dogs away from humanity would not be correct. If I was asked personally are dogs a threat to humanity my answer would be NO and if I was asked is a bad breeder or owner a threat to dogs my answer would be YES!